6. Morgan Welch Inflammatory Breast Cancer Research Program and Clinic, The University of Texas MD Anderson Cancer Center, Houston, TX. 7. Current Address: National Cancer Institute, Klenova 1, 833 10 Bratislava, Slovak Republic. * MM and HG contributed equally to this study. Background: Circulating tumor cells (CTCs) are an independent prognostic factor in metastatic breast cancer (MBC) patients treated by conventional dose chemotherapy. The aim of this study was to determine the role of CTCs and CTCs undergoing epithelial-mesenchymal transition (EMT) in metastatic breast cancer. We used the platform of high-dose chemotherapy (HDCT) and autologous hematopoietic stem cell transplantation (AHSCT) to study the CTCs and CTCs with EMT. Patients and methods: CTCs were enumerated in 21 MBC patients before apheresis and 1 month after AHSCT. CD34-depleted apheresis products were analyzed for CD326+ epithelial and Aldefluor+ cancer stem cells (CSC) by flow cytometry and were depleted of CD45+ cells and assessed for EMT-inducing transcription factors (EMT-TF) by quantitative RT-PCR. Results: Patients with ≥ 5 CTCs/7.5 mL of peripheral blood 1 month after AHSCT had shorter progression-free survival (PFS) (P=0.02) and overall survival (OS) (P=0.02). Patients with apheresis products containing high percentages of CD326+ epithelial cells or overexpressing EMT-TF had shorter PFS. In multivariate analysis, low percentage of CD326+ epithelial cells and response to HDCT with AHSCT were associated with longer PFS, whereas lower CTCs after AHSCT was associated with longer OS. High CTCs, 1 month after AHSCT correlated with shorter PFS and OS in MBC patients undergoing HDCT and AHSCT, while CTCs with EMT and CSCs phenotype in apheresis products are associated with relapse. Conclusion: Our data suggest that CTC and CTCs with EMT are prognostic in MBC patients undergoing HDCT followed by AHSCT. Keywords: metastatic breast cancer, circulating tumor cells, epithelial-mesenchymal transition, high-dose chemotherapy, autologous hematopoietic stem cell transplantation. Breast cancer is one of the most common malignancies in women, and an estimated 207,090 new cases were diagnosed in the United States in 2010 1. Despite advances in breast cancer prevention, diagnosis, and therapy, 5-10% of patients with breast cancer have metastatic disease at initial presentation, and approximately 30% of patients with breast cancer develop metastatic disease during the course of therapy 1. Circulating tumor cells (CTCs) are cancer cells of epithelial origin that are found in the peripheral blood (PB) and are believed to be shed from primary lesions. In patients with metastatic breast cancer (MBC), the number of CTCs in the PB before and during treatment is an independent predictor of progression-free survival (PFS) and overall survival (OS) 2, 3. Superior PFS and OS were observed among patients with fewer than 5 CTCs per 7.5 mL of peripheral blood regardless of primary tumor histology, hormone receptor and HER2/neu status, sites of first metastases, or whether the patient had recurrent or de novo metastatic disease 3, 4. However, the prognostic value of CTC counts in patients with MBC treated with high-dose chemotherapy (HDCT) followed by autologous hematopoietic stem cell transplantation (AHSCT) has never been examined. CTCs can migrate to the bone marrow microenvironment, where they are known as disseminated tumor cells and constitute a reservoir of occult breast cancer 5, 6. In patients for whom HDCT and AHSCT is planned, the cytokine granulocyte colony-stimulating factor (G-CSF) is routinely administered to mobilize hematopoietic progenitor cells from the bone marrow into the peripheral circulation, where they can be harvested for AHSCT 7. However, we hypothesized, that this procedure, while useful in mobilizing hematopoietic progenitor cells, may also inadvertently mobilize disseminated tumor cells into the peripheral circulation and increase the propensity for a shorter time to relapse. Abundant evidence supports a role for stromal cell-derived factor-1 and its receptor CXCR4 in primary and metastatic breast cancer 8. We suggest, that the mechanism underlying this phenomenon is that G-CSF acts on hematopoietic progenitor cells through the cell surface receptor CXCR4, which is also found on MBC cells and thus mobilize disseminated tumor cells as well 8, 9. We recently reported that a majority of disseminated tumor cells express a cancer stem cell (CSC) phenotype 10, and others have suggested that a subset of disseminated tumor cells can be induced to become CSCs 11, 12. To initiate metastases, disseminated tumor cells with characteristics of CSCs must acquire the ability to intravasate into and survive in the peripheral circulation. Induction of epithelial-mesenchymal transition (EMT) results in the acquisition of mesenchymal traits, the expression of stem-cell markers, resistance to chemotherapy and radiation therapy 13 and facilitates the entry of disseminated tumor cells with CSC characteristics into the peripheral circulation thereby promoting metastasis, dissemination, and resistance to anoikis 14. Previously, we observed, that CTC expressing EMT-inducing gene transcripts are likely to be enriched in patients with primary breast cancer who have received neoadjuvant chemotherapy (NAT) and that NAT is unable to eliminate CTCs undergoing EMT 15. In the study reported here, we studied the role of CTCs and CTCs undergoing EMT by using a blood sample collected from patients with MBC undergoing HDCT followed by AHSCT. As part of a continuing study aimed at assessing the prognostic value of the presence of CTCs in patients with MBC treated with HDCT followed by AHSCT at The University of Texas MD Anderson Cancer Center, a total of 21 patients with MBC were studied from September 2007 to March 2010. Inclusion criteria for the continuing study included informed consent, age 18 to 60 years, MBC, histological confirmation of invasive breast carcinoma, and a complete or partial response to pretransplantation standard-dose chemotherapy or hormonal therapy. Each patient underwent a complete diagnostic examination to determine the extent of disease. Patients with concurrent malignancy other than non-melanoma skin cancer in the previous 5 years were excluded. For each patient, age, tumor histology, hormone receptor status, HER2 status, and details of systemic therapy were recorded. The MD Anderson Institutional Review Board approved this study. Hematopoietic progenitor cells were collected using chemo-mobilization plus G-CSF (10 patients) or G-CSF alone (11 patients). The chemo-mobilization regimen consisted of cyclophosphamide 1500 mg/m2 given intravenously [IV] over 24 hours for 3 days for a total dose of 4500 mg/m2; etoposide 250 mg/m2 IV over 24 hours for 3 days for a total dose of 750 mg/m2; and cisplatin 40 mg/m2 IV daily for 3 days for a total dose of 120 mg/m2. Also administered for chemo-mobilization were mesna 500 mg/m2 IV over 30 minutes before the first dose of cyclophosphamide, mesna given as a continuous 24-hour infusion for 3 days for a total dose of 2000 mg/m2, and G-CSF (filgrastim) 5 µg/kg given subcutaneously twice daily from the fourth day of chemomobilization until aphaeresis was complete. For subjects receiving G-CSF alone, G-CSF 5 µg/kg was given subcutaneously twice daily until apheresis was complete. In both groups (chemo-mobilization and G-CSF alone), the dose of G-CSF could be increased up to 10 mcg/kg if collection of CD34-positive (CD34+) hematopoietic progenitor cells during apheresis was inadequate. The dose of G-CSF was rounded to 300 mcg or 480 mcg according to patient weight. Apheresis was based on the standard collection procedure and was performed daily until 5 x 106 CD34+ cells/kg were collected. The minimal acceptable cell dose for transplantation was 2 x 106 CD34+ cells/kg. If fewer than 2 x 106 CD34+ cells/kg were collected by apheresis, additional apheresis was performed, and nonpurged stem cell product was collected for later infusion into the patient along with CD34+ cells. The stem cell graft was processed using an Isolex Magnetic Cell Separator 300i (Baxter, San Diego, CA) to select CD34+ cells. Patients with at least the minimum acceptable number of hematopoietic progenitor cells collected underwent HDCT with cyclophosphamide, thiotepa, and carboplatin as follows: 1) cyclophosphamide 1.5 gm/m2/day IV on days -6, -5, -4, and -3 prior to stem cell infusion; 2) thiotepa 120 mg/m2/day IV on days -6, -5, -4, and -3 prior to stem cell infusion; 3) carboplatin to a total dose determined using the Calvert formula with a target area under the curve of 20, divided into 4 doses IV on days -6, -5, -4, and -3 prior to stem cell infusion; and 4) mesna 500 mg/m2 IV half an hour before the first dose of cyclophosphamide and mesna 2 gm/m2 given as a continuous 24-hour infusion for 4 days. Post-AHSCT therapy could be started at the 1-month follow-up visit. Patients with HER2-amplified tumors received either 1) trastuzumab 2 mg/kg IV once a week or 2) trastuzumab loading dose of 8 mg/kg IV followed by trastuzumab 6 mg/kg IV every third week. Trastuzumab therapy was continued until progression of disease. Patients with tumors positive for estrogen receptor and/or progesterone receptor received hormonal therapy. If patients had responded to hormonal therapy prior to registration for this trial, the same hormonal therapy was continued. If patients had a prior history of resistance to hormonal therapy, they received a different class of hormonal therapy. Hormonal therapy was continued until progression of disease. Patients who had a single bone lesion and no prior radiation therapy underwent radiation therapy 5 weeks after AHSCT. Patients with bone disease could be treated with a bisphosphonate at the discretion of their primary physician. Candidates for bisphosphonates received them 5 weeks after AHSCT. If clinically indicated, patients could receive radiation therapy. The CellSearch system (Veridex Corporation, Warren, NJ) was used to enumerate CTCs in 7.5 mL of PB, as previously reported 3. Briefly, PB samples were subjected to enrichment with anti-EpCAM-coated magnetic ferrous particles, and CTCs were defined as nucleated cells (DAPI positive) lacking CD45 expression but expressing cytokeratin (CK)-8, -18, or -19 3. After depletion of CD34+ hematopoietic progenitor cells, mononuclear cells (MNCs) were obtained by density-gradient centrifugation using Ficoll-Hypaque 1.077 (Sigma) at 400xg for 30 minutes. The MNCs were collected, washed twice with sterile phosphate-buffered saline, and incubated with magnetic beads coated with anti-CD45 antibody (Miltenyi-Biotec, Auburn, CA) before being processed with an AutoMACS Pro Separator (Miltenyi-Biotec) to select for CD45-negative (CD45-) cells, as previously described 15. The CD45-depleted cell fraction was mixed with Trizol LS Reagent (Invitrogen Corporation, Carlsbad, CA) and stored at -80°C until RNA extraction. Total RNA isolation was performed using Trizol LS Reagent according to the manufacturer's instructions. The isolated RNA was dissolved in diethylpyrocarbonate-treated water, treated with DNAse (Ambion Inc., Austin, TX) to minimize contamination by genomic DNA, and subsequently stored at -80°C. All RNA preparations and handling were conducted in a laminar flow hood under RNase-free conditions. RNA concentration was determined by absorbance readings at 260 nm. Total RNA isolated from the CD45-depleted cell fraction was reverse-transcribed using a cDNA archive kit (Applied Biosystems, Foster City, CA), as previously described15. Synthesized cDNA was subjected to fluorescence-based quantitative real-time polymerase chain reaction (qRT-PCR) for the detection of EMT-inducing transcription factor (TWIST1, SNAIL1, and SLUG) gene transcripts (EMT-TFs). In brief, 2.5 μL of cDNA was diluted in 25 μL of reaction volume containing 12.5 μL of TaqMan Universal PCR Master Mix, No AmpErase UNG, 8.75 μL of water, and 1.25 μL of primers. The primers were purchased from Applied Biosystems (TWIST1: Hs00361186_m1, SNAIL1: Hs00195591_m1, SLUG: Hs00161904_m1). Primers were designed to span exon-exon boundaries to exclude possible amplification of genomic DNA. Amplification was performed in an ABI Fast 7500 Real Time PCR system (Applied Biosystems) using the following cycling program: 95°C for 10 min; 40 cycles of 95°C for 15 seconds, 60°C for 60 seconds. All samples were analyzed in triplicate. Quantification of target genes and an internal reference gene was performed using qRT-PCR. Calibrator samples were run with every plate to ensure consistency of PCR reactions. PCR on the non-reverse-transcribed portion of each sample was performed to assess DNA contamination. For all fluorescence-based qRT-PCR assays, fluorescence was detected from 0 to 40 cycles for the control and marker genes in single-plex reactions, which provide the cycles at threshold (CT) value for each PCR product. The CT value is a PCR cycle at which a significant increase in fluorescence is detected because of exponential accumulation of PCR products. Expression of the genes of interest was calibrated against expression of the housekeeping gene GAPDH and was quantified using the delta-CT method with the following formula: ½ ^Ct (target-GAPDH). For each gene, we calculated the ratio between the relative expression in CD45-depleted MNC and the relative expression in unselected MNC. We defined overexpression of EMT-TFs as at least twice the expression observed in the CD45-depleted fraction, as previously reported 15. MNC samples were interrogated for aldehyde dehydrogenase (ALDH) activity using the Aldefluor assay and the manufacturer's protocol (STEMCELL Technologies, Vancouver, Canada). Briefly, 4 x 106 MNCs from patients were suspended in Aldefluor buffer, which contains a proprietary ATP-binding cassette transport inhibitor. One-third of the cells were reacted with 5 µL of the ALDH inhibitor diethylamino-benzaldehyde as a negative control. Both the test reaction and the negative control were incubated for 35 minutes at 37°C in a 5% CO2 atmosphere. Purified anti-CD44 monoclonal antibody (BD Pharmingen, San Diego, CA) was conjugated with Alexa700 using the Zenon antibody labeling kit (Invitrogen) prior to reaction with the Aldefluor-labeled cells. Additionally, preconjugated antibodies to CD24 (PE) and CD45 (PE-Cy7), both from BD Pharmingen (San Diego, CA), and CD326 (APC, Miltenyi Biotec) were used to label cells at room temperature protected from light for 30 minutes. An additional tube of Aldefluor-labeled cells was stained with the appropriate isotype-matched controls. The stained cells were spun down, and the cell pellet was suspended in 200 µL of Aldefluor buffer prior to analysis on an LSR-II flow cytometer capable of discriminating 6-color fluorescence (BD Biosciences, San Jose, CA). Cellular debris was excluded from the analysis based on low forward light scatter. For analysis, epithelial cells in CD34-depleted apheresis products were defined as cells exhibiting the phenotype CD326+CD45dim. That same definition is used throughout the rest of this manuscript. Within the Aldefluor+ epithelial cell population, a subset of CSCs was defined as cells with a CD326+CD44+CD24lo phenotype as previously reported 10. Median follow-up period, calculated as the median observation time, was determined for all patients and for patients alive at last follow-up. OS was defined as the time from AHSCT to the time of death due to any cause or to last follow-up. PFS was calculated from the time of AHSCT to the time of progression, death, or last follow-up. PFS and OS were estimated using the Kaplan-Meier product limit method and compared among groups using the log-rank test. Cox's proportional hazards regression analysis was used to test the statistical significance of several potential predictors of OS and PFS. This modeling was done in a univariable fashion. From this model, we estimated the hazard ratio for each potential prognostic factor with a 95% confidence interval. All potential prognostic factors with P < 0.10 from the univariable analysis were then included in a saturated model, and backward elimination was used to remove factors from the model on the basis of the likelihood ratio test in the multiple regression analysis. For the variables “Response to prior therapy”, “Response to HDCT with AHSCT”, and “HER2/neu status”, since in one of the categories no patient died, the Cox model could not provide a reliable estimation. Therefore, these particular variables were not included in the Cox univariable and multivariable modeling for OS. For comparison of two categorical variables, the chi-squared test or Fisher's exact test was used, as appropriate. The Mann-Whitney test was used to compare the differences between patient subsets in the percentages of cells with CSC phenotype. All statistical tests were two-sided, and P values < 0.05 were considered statistically significant. Patient characteristics are listed in Table 1. The median age of patients at the time of apheresis was 44 years (range, 30-60 years). Most patients had oligometastatic disease (defined as one or small number of metastatic sites), with bone as a predominant site of metastases. The median number of lines of chemotherapy for metastatic disease before HDCT and AHSCT was 2 (range, 0-5). Six patients (28.6%) achieved a complete response to mobilization chemotherapy prior to AHSCT, and 3 additional patients achieved a complete response to HDCT with AHSCT. All patients enrolled in the study underwent AHSCT. Median time between date of baseline CTC and date of apheresis was 22 days; median time between AHSCT and CTC measurement was 29 days. CTCs were detected in 6 patients (range, 1-115 CTCs per 7.5 mL peripheral blood) prior to mobilization. We observed a high degree of correlation between the number of CTCs prior to HDCT with the number CTCs after HDCT with AHSCT (Pearson correlation coefficient = 0.99). At the median follow-up time of 14.4 months, 13 patients had experienced disease relapse, and 7 patients had died due to progressive disease. The median PFS was 10.6 months, and the median OS was not reached. Tables 2 and 3 summarize the Kaplan-Meier PFS and OS estimates by patient, tumor, and treatment characteristics. Patients with ≥ 5 CTCs per 7.5 mL of PB prior to HDCT had non-significantly shorter PFS (HR = 3.4, 95% CI 0.65-17.85; P = 0.15) and OS (HR = 5.93, 95% CI 0.96-36.76; P = 0.06) compared to patients with < 5 CTCs per 7.5 mL of PB (Figs. 1a and 1b). All patients with < 5 CTCs per 7.5 mL of PB prior HDCT had < 5 CTCs per 7.5 mL of PB after AHSCT. One (33.3%) patient with ≥ 5 CTCs per 7.5 mL of PB prior HDCT had a decrease in CTCs to < 5 CTCs per 7.5 mL of PB after AHSCT. CTCs were detected in 9 patients at 1 month after AHSCT (range, 1-131 CTCs per 7.5 mL PB), and patients with ≥ 5 CTCs per 7.5 mL of PB after AHSCT had significantly shorter PFS and OS (Figs. 1c and 1d) (HR = 8.91, 95% CI 1.46-54.26; P = 0.02 and HR = 8.37, 95% CI 1.38-50.88; P = 0.02, respectively). Abbreviations: ER, estrogen receptor; PR, progesterone receptor; HDCT, high-dose chemotherapy; AHSCT, autologous hematopoietic stem cell transplantation; CTC, circulating tumor cell; PB, peripheral blood. The median percentage of CD326+CD45- epithelial cells in CD34-depleted apheresis products was 0.03%, and this value was used as a cut-off to classify patients as CD326+CD45- high or CD326+CD45- low. Patients with CD326+CD45- high had an insignificantly shorter PFS than those with CD326+CD45- low (HR = 3.3, 95% CI 0.96-11.29; P = 0.06, Fig. 2a). Patients with high expression of EMT-related transcription factors were significantly more likely to have disease relapse (Fisher exact test, P = 0.017), and high expression of EMT-TFs was predictive of shorter PFS than low expression of these factors (HR = 4.29, 95% CI 1.26-14.59; P = 0.02, Fig. 2b). Among the 17 patients assessed for the presence of Aldefluor+ cells, 9 patients achieved a complete response with HDCT; these patients had a significantly lower percentage of Aldefluor+ cells in their CD34-depleted apheresis products than patients who did not achieve a complete response (1.1% vs. 0.2%; P = 0.016, Fig. 3a). In addition, apheresis samples with high expression of TWIST1 had a significantly higher percentage of CSCs (Aldefluor+CD326+CD44+CD24lo) than samples with low expression of TWIST1 (10.2% vs. 2.9%; P =0.050, Fig. 3b). Overexpression of TWIST1, but not overexpression of SNAIL1, was positively correlated with the percentage of CSCs in CD34-depleted apheresis products (Spearman's rho = 0.591, P = 0.02). In multivariate analysis of potential prognostic factors in patients treated with HDCT and AHSCT, the percentage of CD326+CD45dim cells in CD34-depleted apheresis products and response to HDCT with AHSCT were significantly associated with PFS (HR = 3.89, 95% CI 1.02-14.88; P = 0.04 and HR = 4.80, 95% CI 1.16-19.90; P = 0.03, respectively). The number of CTCs after AHSCT was the only independent prognostic factor for OS in the multivariate analysis (HR = 8.37, 95% CI 1.38-50.88; P = 0.02). 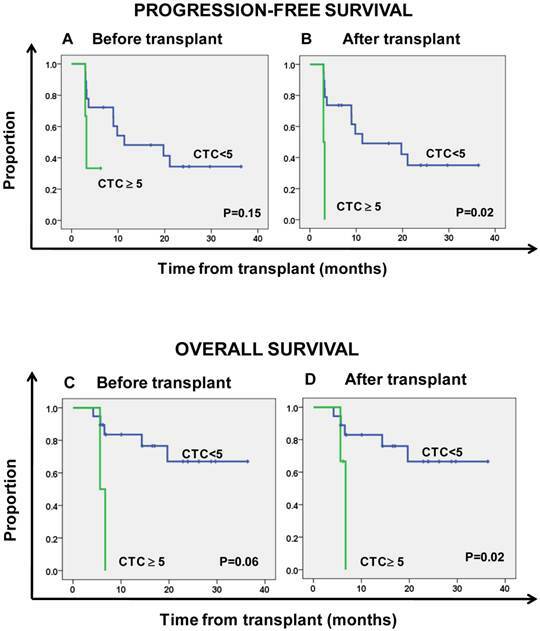 Kaplan-Meier estimates of progression-free survival (A, B) and overall survival (C, D) according to the number of circulating tumor cells (CTC). 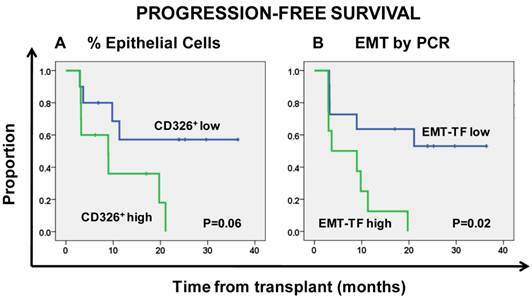 Kaplan-Meier estimates of progression-free survival according to the percentage of CD326+ epithelial cells (A) and overexpression of the epithelial-mesenchymal transition (EMT)-inducing transcription factors (EMT-TF) TWIST1 and SNAIL1 (B). A. Patients with a complete response (CR) had a significantly lower percentage of Aldefluor+ cells than patients without a CR. B. Patients with TWIST1-high tumors had a significantly higher percentage of breast cancer stem cells (Aldefluor+ CSC) than patients with TWIST1-low tumors. Abbreviations: HDCT, high-dose chemotherapy; AHSCT, autologous hematopoietic stem cell transplantation; HR, hazard ratio; CI, confidence interval; ER, estrogen receptor; PR, progesterone receptor; CTC, circulating tumor cells; PB, peripheral blood. *The median percentage of CD326+ epithelial cells in CD34-depleted aphaeresis products was 0.03%. This value was used as a cut-off to classify patients as CD326+CD45dim high or CD326+CD45dim low. **Overexpression was defined as at least twice the expression observed in the CD45-depleted fraction. Kaplan-Meier estimates of overall survival in patients treated with HDCT and AHSCT. *The median percentage of CD326+ epithelial cells in CD34-depleted aphaeresis products was 0.03%. This value was used as a cut-off to classify patients as CD326+CD45- high or CD326+CD45- low. In this study, we found that among patients with MBC undergoing HDCT followed by AHSCT, patients with ≥ 5 CTCs per 7.5 mL of PB 1 month after AHSCT had shorter PFS and OS, and patients with apheresis products containing high percentages of CD326+ epithelial cells or overexpressing EMT-TFs had shorter PFS. These findings suggest that additional therapy is needed in patients with these characteristics to eliminate cancer-initiating cells. HDCT failed to improve the prognosis in MBC patients; thus, there is an urgent need to identify new biomarkers that can be used to select patients who might benefit from this approach 16. Numbers of CTCs before and during treatment are independent predictors of outcome in MBC patients 2-4. In MBC patients treated with conventional-dose chemotherapy, we observed that multi-agent chemotherapy was superior to single agent treatment in terms of PFS both in patients with < 5 CTCs per 7.5 mL of PB and in patients with ≥ 5 CTCs per 7.5 mL of PB, although the benefit provided by combination regimens was more evident in patients with ≥ 5 CTCs 17. In the current study we observed a high degree of correlation between CTCs levels pre- and post-HDCT; however, HDCT with AHSCT was able to change the CTC prognostic category in 1 of 3 patients with initially poor prognosis (≥ 5 CTC). Despite the small sample size, we found evidence that the presence of ≥ 5 CTCs per 7.5 mL of PB 1 month after AHSCT predicted shorter PFS and OS in patients receiving HDCT followed by AHSCT. There was a trend toward the presence of ≥ 5 CTCs per 7.5 mL of PB detected before HDCT to predict shorter OS (P = 0.06). These data suggest the independent prognostic value of CTCs regardless of the dose intensity of the chemotherapy regimen. As the presence of disseminated tumor cells in bone marrow predicts a poor prognosis in breast cancer patients 5, 6, we evaluated CD34-depleted apheresis products for the presence of epithelial cells and expression of EMT-TFs to determine if the presence of these biomarkers had an impact on the clinical outcome of MBC patients undergoing HDCT followed by AHSCT. We speculate that the presence of CD326+ epithelial cells in the CD34-depleted apheresis products may reflect disseminated tumor cells in the bone marrow mobilized with G-CSF. We found that the presence of > 0.03% of CD326+ epithelial cells in CD34-depleted apheresis products was predictive of a shorter PFS in patients undergoing HDCT followed by AHSCT, independent of other factors. While the EMT-inducing transcription factor TWIST1 was linked to metastasis 18, 19, SNAIL1 was linked to recurrence 20 in human cancers. TWIST1 contributes to metastasis by promoting EMT 18 and directly targets BMI1 to cooperatively repress expression of E-cadherin 19. In our study, patients with TWIST1-high cells in their CD34-depleted apheresis products had a significantly higher median percentage of breast cancer stem cells with the Aldefluor+CD326+CD44+CD24lo phenotype than did patients with TWIST1-low cells in their CD34-depleted apheresis products (Table 2). These data suggest that TWIST1 may play an important role in promoting self-renewal, treatment resistance, and/or proliferation of breast cancer stem cells that leads to early disease relapse. Nevertheless, this study is limited as we utilized a qRT-PCR method that does not allow visualization of CTCs and the detection of CTCs undergoing EMT by qRT-PCR is an indirect approach. The prognostic value of tumor cells within peripheral blood stem-cell harvests remains of great clinical interest; however, the contribution of tumor cells in the graft to systemic relapse after transplantation is still uncertain 21, 22. Studies have not consistently demonstrated inferior outcomes for patients whose autologous blood or bone marrow stem-cell collections were contaminated by cancer cells 23-29. The inconsistency in previous reports could be attributed to the inability to detect tumor cells in stem-cell harvests due to the ability of tumor cells to undergo EMT 15. In the present study, we observed that high expression of EMT-TFs in CD34-depleted apheresis products was predictive of shorter PFS. We suggest that a CD34-enriched stem-cell harvest could be a source of CTCs with EMT and/or stem cell properties. While reinfusion of viable cancer cells could be a possible source of tumor regrowth, other causes of relapse are more likely linked to systemic disease that is not eradicated by HDCT 21. Finally, despite a small sample size, this is the first study to demonstrate that the presence of ≥ 5 CTCs per 7.5 mL of PB 1 month after AHSCT is a prognostic factor for shorter PFS and OS in MBC patients undergoing HDCT and AHSCT. This observation is consistent with previous data in MBC and confirmed the robust prognostic value of CTCs detected by the CellSearch system 3, 4. This finding was also supported by the association between a higher percentage of CD326+ epithelial cells in the apheresis product and a shorter PFS. Moreover, following G-CSF mobilization, the presence of CTCs undergoing EMT as measured by the overexpression of TWIST1 or SNAIL1 by qRT-PCR is predictive of early disease relapse. Whereas epithelial cells undergoing EMT correlated with the acquisition of stem cell traits by epithelial cells 13, others have suggested that CSCs expressing CXCR4 7 might be mobilized by G-CSF. The current data corroborate these observations by demonstrating a high percentage of Aldefluor+ CSCs in CD34-depleted apheresis products that was associated with expression of TWIST1 and lack of complete response to HDCT and AHSCT. Collectively, these observations suggest that additional therapy is needed for patients with CD34-depleted apheresis products to eliminate the cancer-initiating cells, i.e CSCs and/or CTCs with EMT phenotype, responsible for the shortened PFS and potential dissemination of metastatic disease. AHSCT: Autologous hematopoietic stem cell transplantation; CSC: Cancer stem cells; CTCs: Circulating tumor cells; EMT: Epithelial-mesenchymal transition; EMT-TF: EMT-inducing transcription factors; G-CSF: Granulocyte colony-stimulating factor; HDCT: High-dose chemotherapy; NAT: neoadjuvant chemotherapy. Michal Mego was supported by a UICC American Cancer Society International Fellowship for Beginning Investigators, ACSBI Award ACS /08/006. Naoto T. Ueno is the recipient of a grant from the University of Texas Health Science Center for Myeloablative Allogeneic Hematopoietic Stem Cell Transplantation with Bevacizumab for Advanced Solid Tumor -1RR024148-02. Massimo Cristofanilli is the recipient of a grant from the State of Texas Rare and Aggressive Breast Cancer Research Program. In addition, we acknowledge grant from the National Cancer Institute entitled “Human Breast Cancer Stem Cell Surrogates” (CA138239-02) to Massimo Cristofanilli and James M. Reuben and Predoctoral Student Trainee Fellowship grant to Evan N. Cohen from Department of Defense (W81XWH-09-1-0031). This research was also supported in part by the National Institutes of Health through MD Anderson Cancer Center Support Grant, CA016672. We wish to acknowledge Matthew M. Galland for preparing samples and Michelle Davis for coordinating clinical sample collection. Finally, we wish to acknowledge the editorial support of Ms. Stephanie Deming. MM, HG, ENC, ST, AG, QW performed lab work and manuscript write up. PL performed statistics, BNL, YN participated in patient treatment and collection of clinical data and writing the manuscript, REC, GNH, MC, NTU, JMR involved in study design, critical discussion and manuscript writing. All the authors read and approved the final manuscript. Corresponding author: James M. Reuben, PhD. Professor, Department of Hematopathology, Unit 054, The University of Texas MD Anderson Cancer Center, 1515 Holcombe Blvd, Houston, TX 77030, USA. Or Naoto T. Ueno, MD, PhD. Professor, Department of Breast Medical Oncology, Unit 1354, The University of Texas MD Anderson Cancer Center, 1515 Holcombe Blvd, Houston, TX 77030, USA.